Started in 2007 Record Store Day is an annual event to celebrate the independent music store. Record Store Day has grown into an international event, and many artists and record companies release special vinyl records for the day, only available in participating stores. This year Universal Music is releasing a special 12 inch blue glitter single of ‘Voulez-Vous (Extended Dance Remix)’ back with ‘If It Wasn’t For The Nights’, also from the Voulez-Vous album. The single is limited to 5,000 copies. The remix of ‘Voulez-Vous’ was first released on a US promotional 12 inch single in 1979, and first commercially released on The Definitive Collection double CD in 2001. The ABBA Fan Club Shop will have some copies for sale for fans, though at this stage it is not known how many copies. 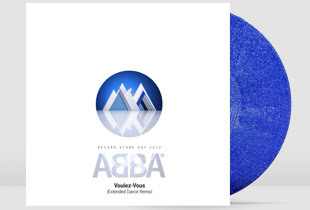 Presumably it will also be available through ABBA – The Official Site, as its webstore is run by Bengans, which fits the description of an independent record store. Record Store Day is Saturday 21 April, 2012. The release of The Visitors in late 1981 took me completely by surprise. Though I’d read news of the progress of recording sessions in the Australian ABBA Fan Club magazines during the year, I had no idea that ABBA had a new album coming out until I heard an ad on a local radio station during the first week of December promoting a competition giving away copies the following week. That Saturday morning the music show Sounds showed the album cover, which confused me – I could see Agnetha to the left and Frida in a chair, and what looked like Benny standing a little to the right (well, it was a man with a beard), but where was Björn? The following night Australia’s famous music show Countdown played the promotional clip for ‘When All Is Said And Done’, but otherwise made no mention of a new ABBA album. As the summer holidays were coming up, that weekend saw the last shows for the year for both Sounds and Countdown, so there was no real opportunity for TV promotion for ABBA’s new album. Countdown did play ‘One Of Us’ on its first show for 1982, by which time it was too late for that single, which had already peaked at 48 and was on its way back down the singles chart. Sounds eventually played ‘Head Over Heels’, which was not released as a single in Australia. Ironically, the radio station giving away copies of The Visitors did not play any songs from the album, or any ABBA music at all, except for the first line of ‘Slipping Through My Fingers’ in the competition ad. Nor did the ad actually mention the album title. And so came the usual waiting game for the album to appear. As ABBA were no longer the big thing in Australia that they were in 1976, there didn’t seem to be much rush to get new ABBA records in the shops, and it wasn’t until Wednesday December 16th (yes, Benny’s birthday) that I finally got The Visitors. In Australia The Visitors came in a gatefold sleeve, with the lyrics on the inside, which seemed like a waste to me – why not more photos, as other gatefold sleeve albums had? I later learned that in most other countries the lyrics were on an inner sleeve. I loved the imagery, but was pissed off that the ABBA members, who seemed to be getting smaller on each progressive album cover, were hard to discern. So Björn now had a beard, and Benny was in the dark corner on the far right, but was Frida’s hair cut short? It was hard to tell. On first listen I was mightily impressed. ABBA’s music always seemed to exist outside of mainstream music trends, but here was ABBA sounding like those British synthpop groups so popular at the time. Especially the opening title track, which has been described over the years as having a melody that sounded reminiscent of The Beatles Eastern musical excursions, but to my ears sounded like ‘Astradyne’, the opening track to Ultravox’s 1980 album Vienna, with the chorus that sounded like ‘Summer Night City’. I also loved that ABBA’s lyrics had become more meaningful – the dissident paranoia of ‘The Visitors’, fears of dictators leading the populace into war in ‘Soldiers’, and the bittersweet experience of watching children grow up and leave in ‘Slipping Through My Finger’ were immediately obvious to me. The heartbreak of ‘When All Is Said And Done’ was more inspirational than the previous year’s melodramatic ‘The Winner Takes It All’, and its personal inspirations were also obvious. ‘I Let The Music Speak’ addressed the poetry of music in clever twists and turns. ‘Two For The Price Of One’ was a little throwback to the quirky songs of ABBA’s first couple of albums, but unlike almost everyone else in the world I liked it from the start. The only songs that didn’t grab me on the first listen, and still don’t particularly like, were ironically the two selected as international singles: ‘One Of Us’ and ‘Head Over Heels’. Possibly that’s coloured by the fact that they were the singles, chosen over such obvious choices as ‘When All Is Said And Done’ (actually the first single in the USA and second single in Australia) and ‘The Visitors’ – even Phil Collins, producer of Frida’s 1982 solo album Something’s Going On, thought ‘The Visitors’ was an obvious single for the times. At the end of my first listen to the whole album, as the music box of ‘Like An Angel Passing Through My Room’ faded away and the incessant ticking clock suddenly stopped, I knew that ABBA was over, that this would be their final album.